That’s how J.P. Rupp felt yesterday after being reunited with the two cougar kittens that he helped rescue from a wildfire in Montana at the end of August. Rupp, a wildland firefighter for the U.S. Forest Service in western Montana, got to play with the curious cubs at the Columbus Zoo and Aquarium yesterday. 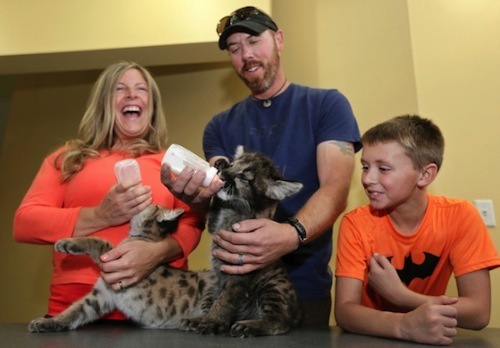 He, his wife, Shakti, and their two children had been planning a visit to see family in central Ohio when he learned that the cubs were recovering at the zoo. Jack Hanna, the zoo’s director emeritus, had arranged to bring the cougars to Columbus after hearing about their rescue. The male cubs — named Lewis and Clark — were treated for smoke inhalation. Firefighter J.P. Rupp with the cubs, his wife Shakti O’Melveny-Rupp, and his son Jonathan Rupp, 9.